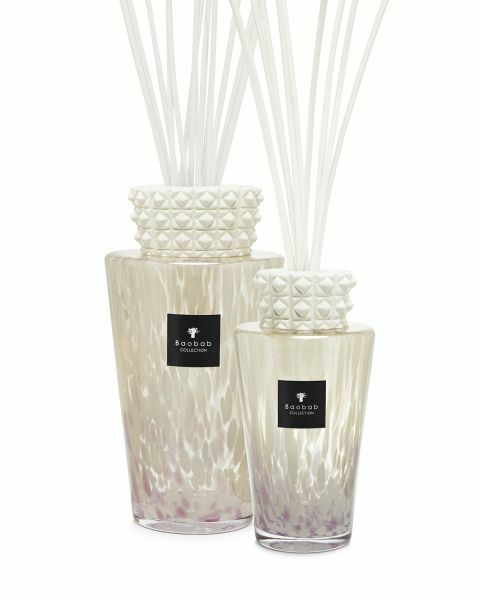 The Muzi fragrance diffuser is hand crocheted by women artisans in Madagascar. 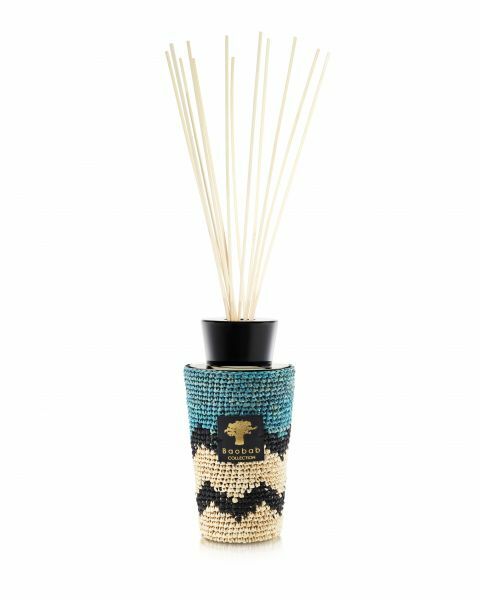 Its jagged pattern is inspired by Ndebele women’s paintings. The Muzi diffuser, with its balanced combi- nation of black, beige and turquoise is a decorative object in its own right. 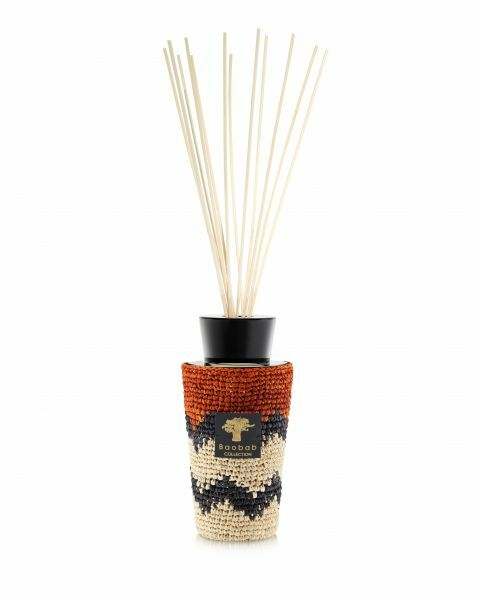 The Mabhoga fragrance diffuser is covered with black, beige and ochre raffia, the colours used in the Ndebele women’s painting. 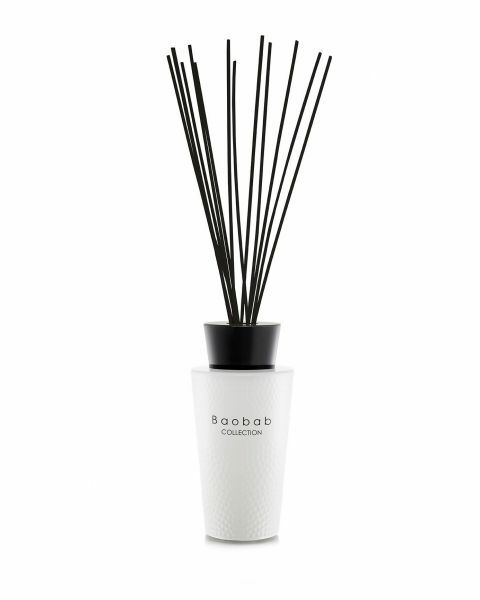 Its geometric pattern is the perfect match for any style of interior design. 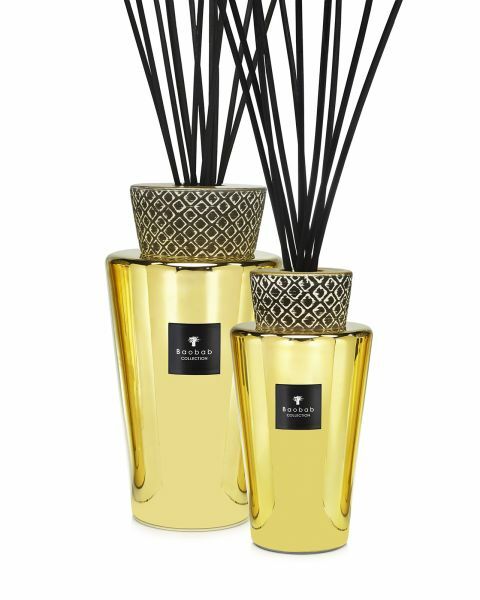 The Diana diffuser has a metallic sheen that ranges from a deep red to an olive green. Matching the candle that bears its name, it combines timeless elegance and functional decoration. 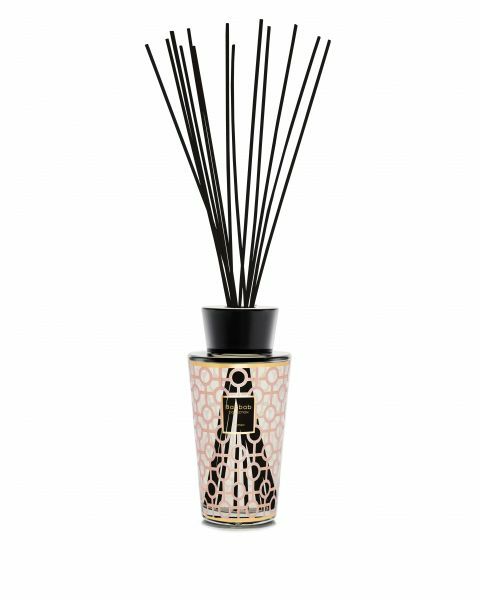 In keeping with the Women scented candle, the Women fragrance diffuser is adorned with an elegant gold and pink print that draws its inspiration from the female symbol. The Gentlemen diffuser is covered in a silver and navy blue print, with colors inspired by classic menswear. 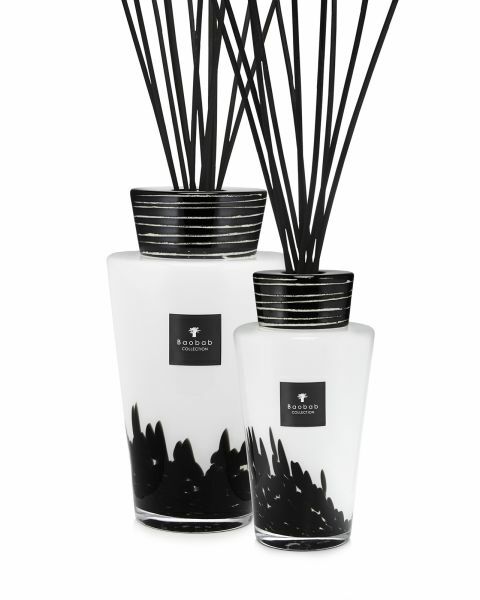 Inspired by the fascinating pearls of Tahiti, whose shimmer can range from a silvery grey to anthracite, the Black Pearls candle is defined by its dark and mysterious appearance. The moonstone is known for its mesmerizing interaction with light. For centuries, many thought it showcased different phases of the lunar cycle. In India, the moonstone is seen as the “stone of dreams” bringing incredible visions to those who possess it. 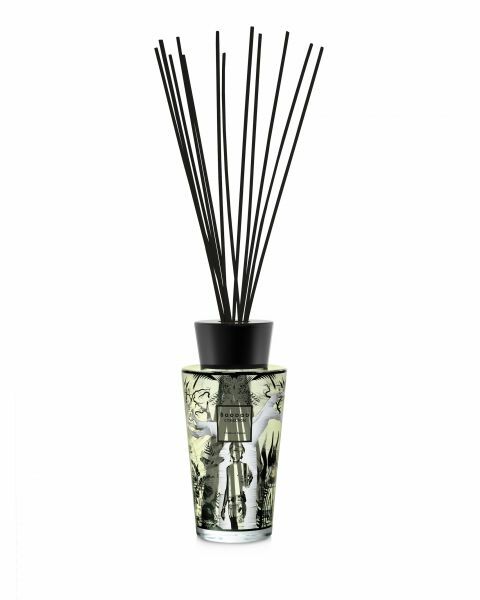 The Feathers perfume diffuser is covered in a Yann Legendre fresco that illustrates the boy that embodies this collection. Decorated with Yann Legendre's fresco, the Feathers Touareg diffuser is a refined object of interior decoration. 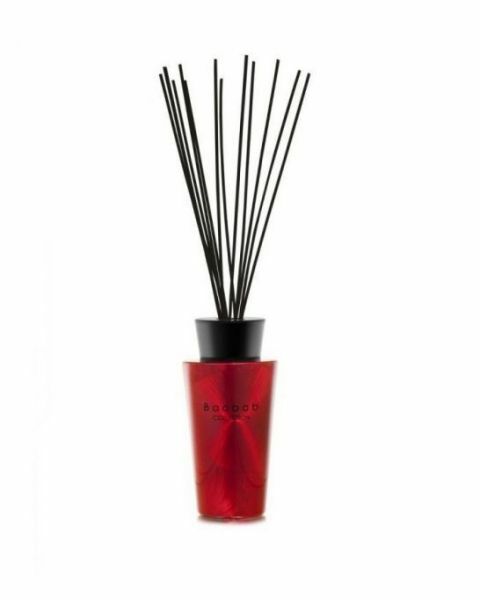 The Feathers Masaai Limited Edition Diffuser comes in a vibrant red brushed glass bottle that references the tribes notoriously red attire. The Touaregs, also called the blue men due to the color of their attire, are a nomadic tribe seen as lords of the Desert. 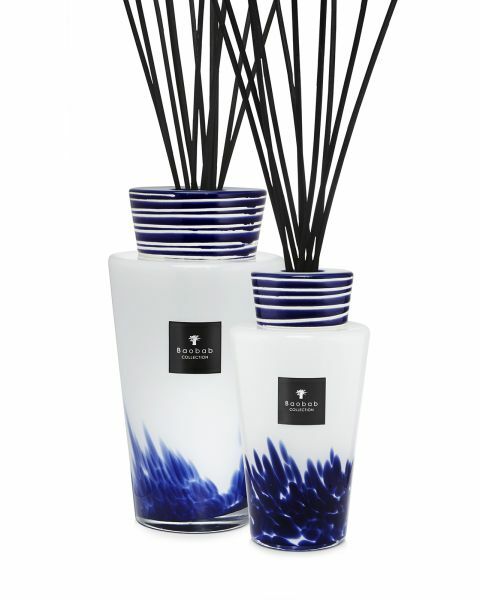 The Feathers Touareg candle references the color of this tribes majestic appearance with its dark blue details. 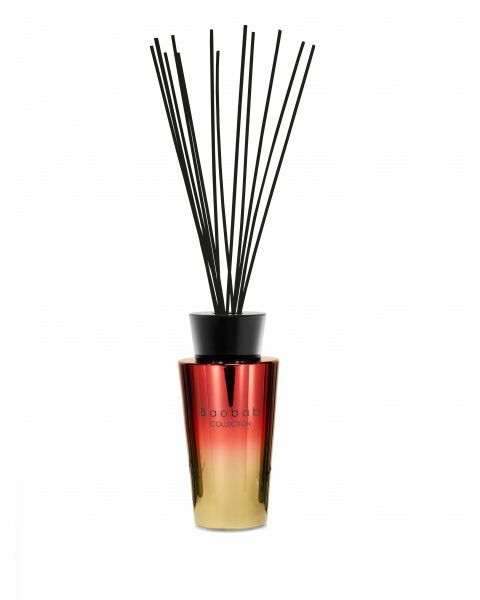 Inspired by the red capes worn by Masai warriors, the Feathers Masaai candle includes two shades of red on opalescent glass so as to create a more drastic all-over feathers effect. Kheops is the largest of the three pyramids of Giza, the oldest and most preserved of the Seven Wonders of the World. Kephren is the pharaoh Khafre’s Greek name. The second Pyramid of Giza and the Great Sphinx were built during is long reign and are part of his legacy. 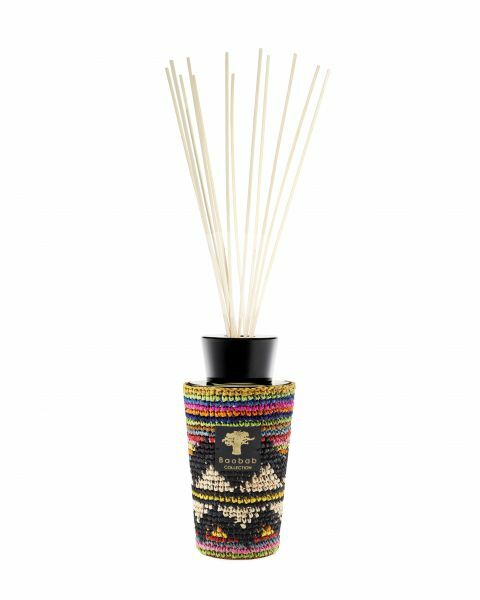 The Arusha Forest pays tribute to the national Arusha forest located in northern Tanzania, where nature comes alive after each yearly rainy season. For centuries, the island of Zanzibar, located off the coast of Tanzania, has played an important part of the spice trade. 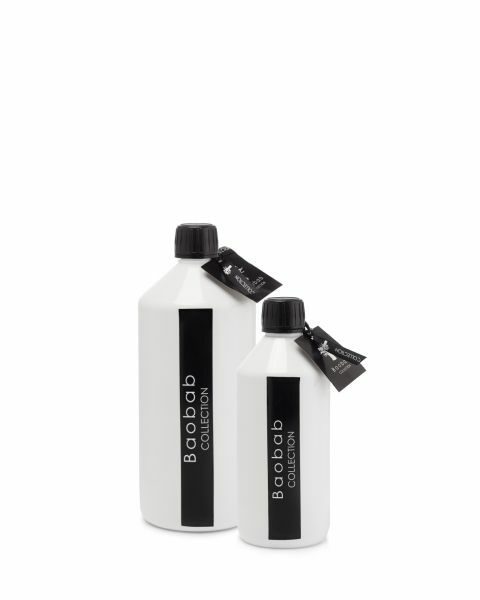 Quintessentially exotic, the island offers its visitors an incredible variety of colors and landscapes. The white rhinoceros, an African breed on the brink of extinction, is one of the animal most often preyed on by hunters for its precious horn. 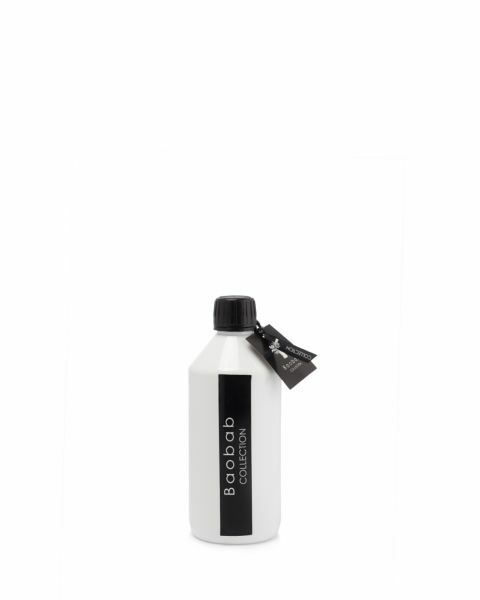 The rhinoceros is known for its incredible sense of smell which allows it to orient itself and search for fresh grass. The Victoria Falls or “Mosi-ga-Tunya,” which means “the smoke that thunders,” is one of the Seven Wonders of the World. Tanzania’s national Serengeti Park, which means “endless place” in the Masaai language, is the most notorious animal reserve in the world. A land for mating rituals during the season of love, the park is home to the largest concentration of wildlife in Africa. 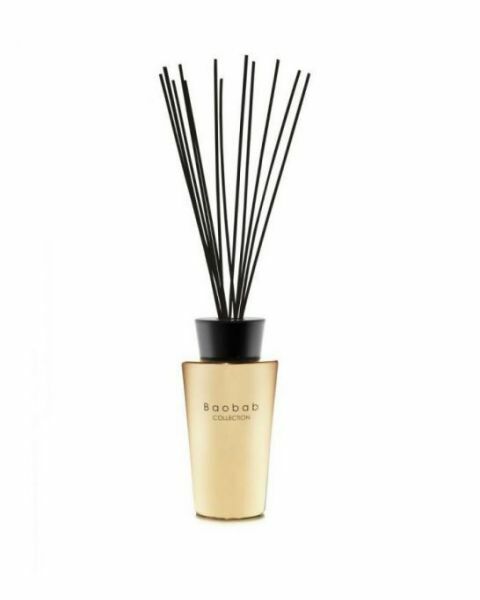 Located in the heart of southern Africa, the Miombo woodlands are an exotic combination of tropical prairies and savannahs. They are home to an incredible fauna, including elephants, rhinoceroses, and giraffes. For centuries the Masaai, a tribe native to Tanzania, have been wearing red as their traditional color. This nomadic tribe usually wears red capes, a color that is both a representation of the desert earth and the intense sun. 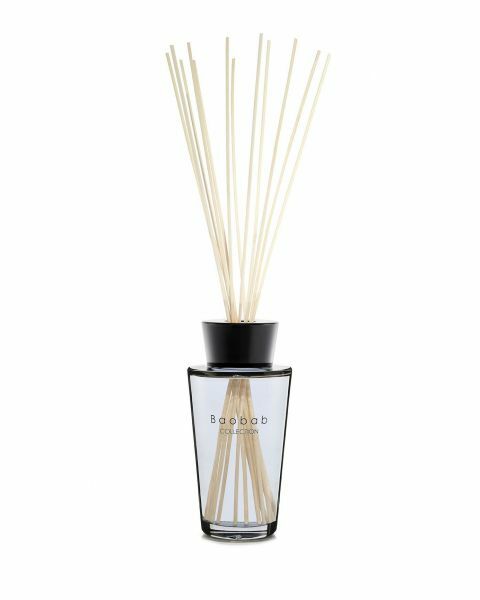 Thanks to the 500 ml Wild Grass scented refill, replenish your fragrance diffuser when empty. 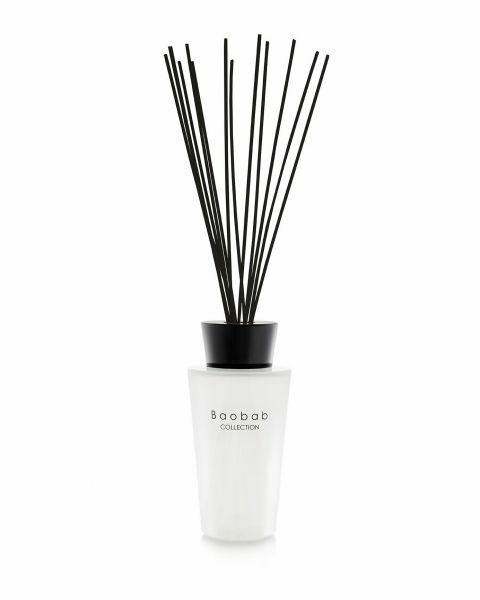 Fill up your Zanzibar Spices diffuser with this 500 ml fragrance diffuser refill.